Analytics platforms are essential for merchants to glean insight into what drives their traffic. 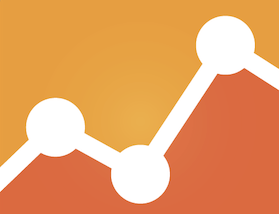 Google Analytics is the popular choice, but there are many other analytics tools available. 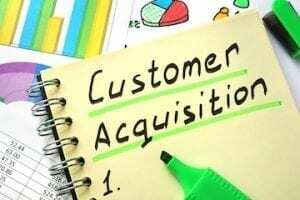 Here is a list of analytics tools to help you collect and measure your customer data. Some of these applications are general analytics programs, akin to Google Analytics, to quantify traffic. Other applications look at specific aspects of the customer and should be used in conjunction with a general analytics program. 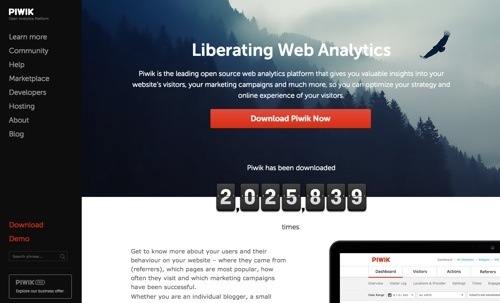 Piwik is an open source, web analytics solution that’s self-hosted. 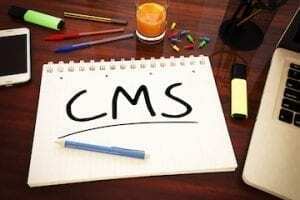 It provides detailed reports on your website and its visitors, including the search engines and keywords they used, the language they speak, which pages they like, the files they download and more. Piwik offers real-time web analytics reports, historical comparisons, and geolocation data. Piwik also has mobile apps for iOS and Android. Price: Free. 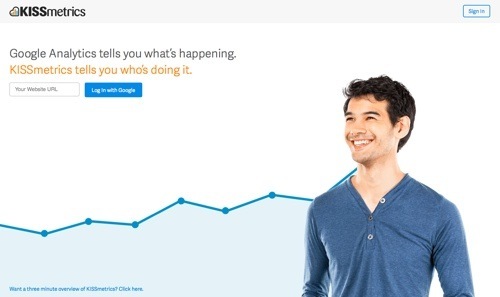 KISSmetrics is an analytics tool that focuses on tracking your visitors, their actions, and origins. With data tied to people, you can obtain the conversion rate from initial visit all the way to purchase, even if it takes six months and multiple visits. 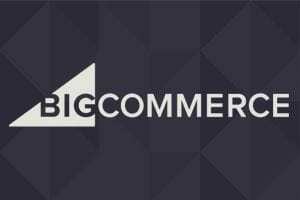 Get the conversion rate between any two events for your business. See your lifetime value, average revenue per user, and churn rates. KISSmetrics is all about helping you to optimize your conversion rate by discovering your most lucrative referral sources. Price: Plans start at $179 per month. 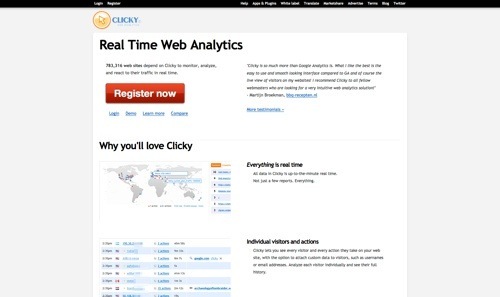 Clicky lets you see every visitor and every action she takes on your website, with the option to attach custom data to visitors, such as usernames or email addresses. In addition to standard per-page heatmaps, Clicky also lets you view heatmaps for individual visitor sessions. Set up alerts to be notified of conversions, campaign visitors, logged-in visitors, and more. Price: Free version available. Premium plans start at $9.99. 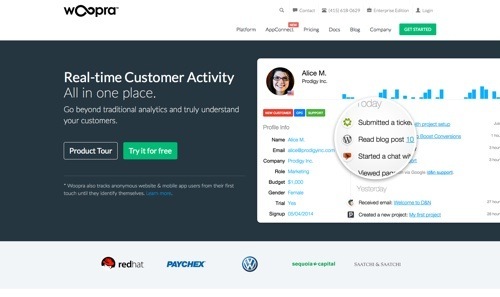 Woopra is another platform for measuring your customer with real-time analytics. With a profile for each user, track each user’s activity, including website, mobile app, email, help desk and live chat. 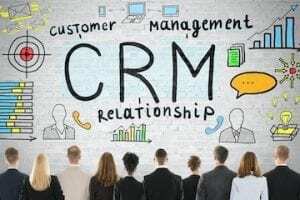 Leverage data with customer segments that update in real-time. Build funnel reports and compare different customer segments to understand why leads don’t convert. Retention reports help to understand if users are engaged enough to keep coming back. Price: Plans start at $79.95 per month. 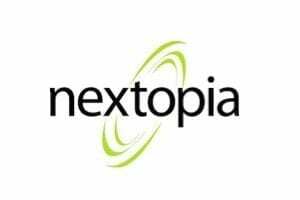 Open Web Analytics (OWA) is an open source, web analytics program that you can use to track and analyze how people use your websites and applications. 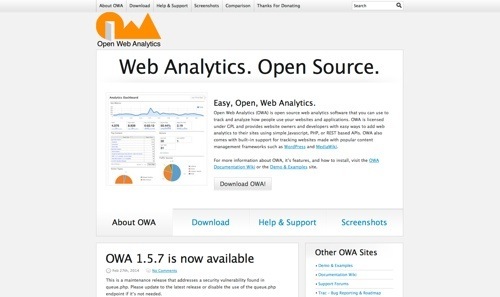 OWA was born out of the need for an open source framework that could be used to easily add web analytics features to web sites and applications. OWA includes a plugin to seamlessly integrate with WordPress and includes a number of WordPress specific features for tracking visitors. Price: Free. 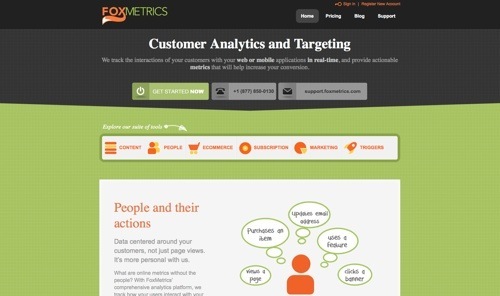 FoxMetrics is a real-time analytics platform to track actionable data that matters to your business. You can record events from any application that supports HTTP requests, such as your website, and mobile and desktop applications. 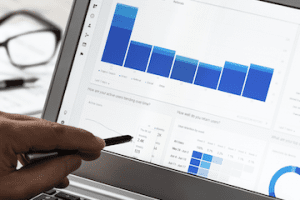 Work with the data from within your dashboard, creating segments, funnels, ad-hoc reports, real-time drill downs, and more. As a compliment to its platform, FoxMetrics encourages the use of traditional page view analytics tools, such as Google Analytics. Price: Plans start at $20 per month. 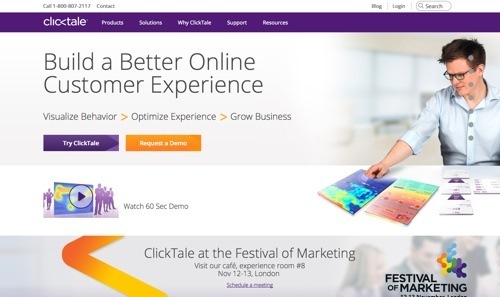 ClickTale provides you with on-demand session playbacks of individual customers. Understand how visitors experience your site with four different heatmaps: mouse move, click, attention, and scroll-reach. Get statistics for every page element in your heatmap. Receive in-form analytics to discover which fields are left blank and why visitors leave. Increase the conversion rate of your forms and funnels with session playback. Price: Contact for pricing. 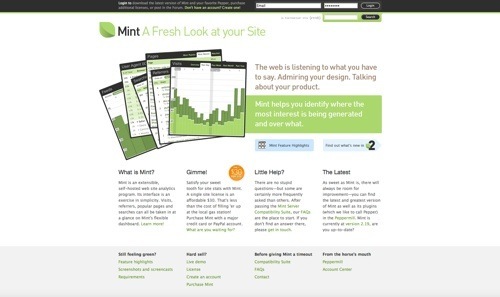 Mint is a self-hosted website analytics program. Break down visits, referrers, searches, pages, popular or recent content, and browser families. Check activity from the past day, week, month, and year. Reveal feed subscription patterns, ideal design dimensions, and more. Price: $30 one-time fee. GoingUp! 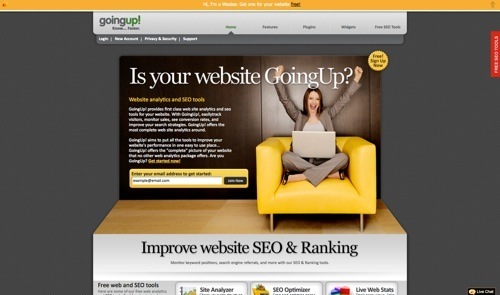 is a solution that combines website analytics and SEO tools. 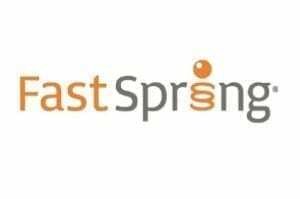 Get your traffic trend analysis, referring keywords, heat maps, recent visitor locations, inbound link monitoring, Google PageRank, and Alexa Rank tracking, all in one place. Price: Free. 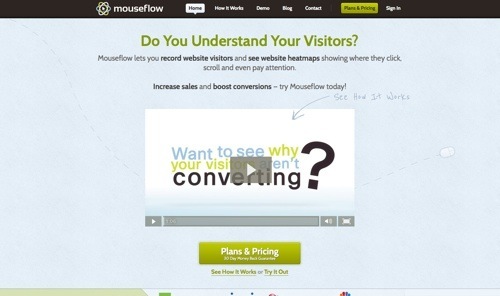 Mouseflow is a recording tool to capture all visitor mouse movements, clicks, scrolls, and keystrokes to understand the behavior of your customers. 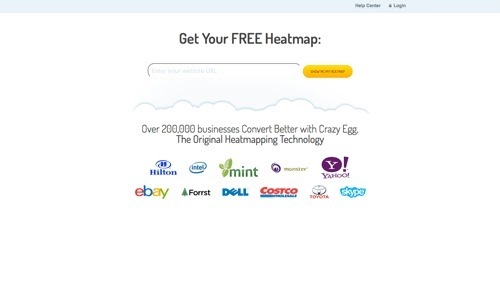 Use heatmaps and in-page analytics to quantify visitor behavior. Get average page size, rendering time, number of clicks, hover and click stats for site links, and more. Price: Free plan offers 100 recorded sessions. Paid plans start at $19 per month. Chartbeat is a simple real-time tool to find out who’s on your website and what they’re doing. 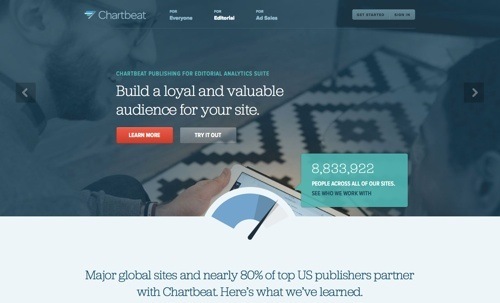 Chartbeat gives you engagement metrics, traffic breakdowns, and social network monitoring. 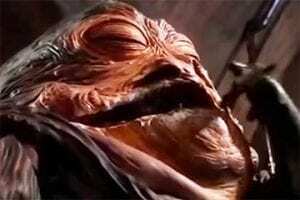 Chartbeat also offers an advanced platform for heavy content sites with larger editorial teams. Price: Plans start at $9.95 per month. 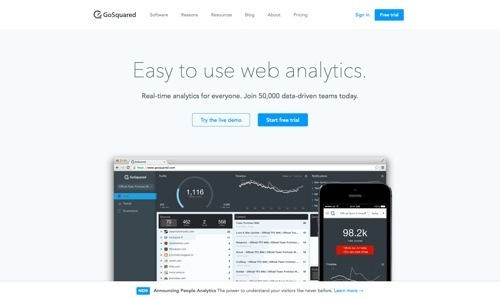 GoSquared is focused on providing real-time customer analytics in an elegant, functional and intuitive design. GoSquared believes businesses will connect with more customers in more meaningful ways if they can easily access and take action on their data. 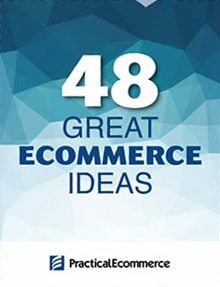 Get one-click access to trends data and instant insight into ecommerce performance. Price: Plans start at $18 per month. 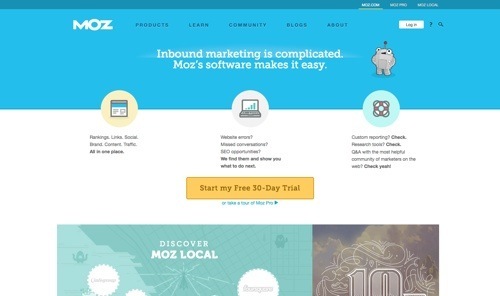 Moz Analytics is a tool to measure your search, social, brand, and content marketing. Moz Analytics tracks the performance of all your inbound marketing efforts on one platform, then shows you the relationships between your content, SEO, social activity, brand mentions, and inbound links. Moz doesn’t measure your traffic, so this is an analytics tool to use in conjunction with a general traffic application like Google Analytics. Price: $99 per month.